On this tour we will visit a few of the beautiful islands of southern Myanmar, visit fish farms and an island village, hike through the tropical jungle, meet the local Moken people, and relax on the beach after snorkeling. 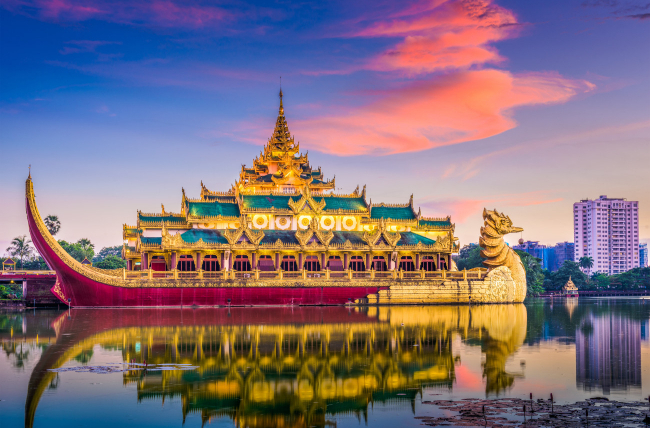 We welcome you to the land of glittering pagodas. On your arrival, our friendly guide and driver will greet you at the airport and we will then visit the Chauk Htet Kyi reclining Buddha, and then check-in at the hotel for refreshments (check-in time is after 2 pm). Afterwards, we will walk around Kandawgyi Park and take photos of Karaweik Hall with views of Shwedagon Pagoda from a distance. The evening we will spend at the grand Shwedagon Pagoda and afterwards go back to the hotel. We take an early morning flight to the southern town of Myeik, one of the biggest fishing towns in Myanmar. “Beik”, as the locals call their hometown, produces everything for the fishing industry. We will visit the ship dockyards where they still build the wooden boats like in the old days. One of the main export products is soft shell crabs. We will most likely see the molting the crabs shedding their old shells for brand new ones. We can also taste these crabs at the local snack market. We will continue with a stroll along Myeik’s main street through the colonial quarter. For sunset we have two options: either we take a traditional longtail boat across to Pathaw Pathet Island (10 min, on your own expense) and then walk up a small hill for a magnificent 360 degrees view over the town and nearby island, or we stay in town and mingle with the locals at the Thein Daw Gyi Pagoda. Overnight in Myeik. After breakfast at the hotel, we start our cruising tour to the Mergui Islands. First, we will visit Chester Island, called Kyal Laik by the locals. It takes about 3 or 4 hours cruising time to reach the island. Upon arrival, we will walk on the white sandy beach and do water activities such as swimming and snorkeling. Afterwards we visit Dana Theik Di Island to swim in the crystal clear waters and also enjoy the sunset. While snorkeling we may see cardinalfish, clownfish, surgeonfish, and many other species. You can overnight in a tent on the beach or on the boat as per your preference. After having breakfast, we continue on to Bailey Island which is one of the best snorkeling sites where we will have a seafood lunch on the boat. After lunch we continue to Smart Island where we can walk along the beach, sunbathing, swimming, and snorkeling among the corals and colorful fish. Afterwards we proceed to Thayaw Thahan Kyi Island where you can overnight in a tent on the beach or on the boat as per your preference. Today we will explore the beautiful nature and the fascinating life of the Sea Gypsies (Moken people) at Dome Palae Aw Village. The Moken people are experts in diving and living on the sea. After spending time with the Moken people we return to Myeik. After breakfast at the hotel we will transfer to the airport for the flight to Yangon. Upon arrival, we go to the Bo Gyoke Aung San Market and Junction City for shopping. Both are connected by a walkway bridge. In Bo Gyoke Aung San Market are over 2,000 shops for clothes, gemstones and jewelry, Myanmar traditional arts & crafts, and souvenirs. Junction City is a first class mall with brands from all over the world. Food and drinks are also available. When done, we return to the hotel. After breakfast transfer to the Yangon International Airport for your departure flight.